A 38-center clinical trial sponsored by the National Institutes of Health and led by researchers at the Stanford University School of Medicine has shown that far more people than previously thought can benefit from an emergency procedure for acute ischemic stroke. The improved outcomes were achieved through the use of brain-imaging software developed at Stanford. The software helps identify stroke patients who could benefit from a clot-removal procedure, known as thrombectomy, after the window of time during which it has generally been considered helpful has closed. Some patients showed dramatic improvement even when their brain clots were removed as long as 10 hours after the end of this six-hour window. “Nearly half of all patients treated between six and 16 hours after the onset of their symptoms were largely spared from the consequences of their stroke,” said the trial’s principal investigator, Gregory Albers, MD, who is the Coyote Foundation Endowed Professor of Neurology and Neurological Science and the director of the Stanford Stroke Center. 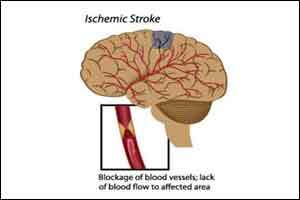 Ischemic strokes account for about 85 percent of the roughly 750,000 strokes suffered annually in the United States. They occur when blood supply to part of the brain is cut off by a clot in a cerebral blood vessel. The resulting lack of oxygen and glucose quickly kills brain tissue in the immediate area, and the affected area continues to expand until blood supply is restored. On the night of April 23, 2017, Cindi Dodd, a 46-year-old graphic designer who lives in Salinas, California, went to bed around 10:30 p.m., anticipating a 5 a.m. wake-up by her husband, as she was scheduled for outpatient surgery at Stanford. She did arrive at Stanford the next morning — not as an outpatient but as the victim of a massive ischemic stroke. “My husband woke me up at 5 o’clock as planned, and when I started to speak to him I knew what I was trying to say in my mind, but it had nothing to do with the sounds that were coming out of my mouth,” Dodd said. Her left side was paralyzed. Her husband called 911. An ambulance arrived shortly afterward and rushed Dodd to Salinas Valley Memorial Hospital. But because she’d had the stroke while asleep, the “clock” determining whether she could be administered a clot-busting medication or clot-removing thrombectomy had already started ticking. For stroke patients, the clock starts at the last time they’re seen well, and for Dodd that was 10:30 p.m. the previous day. It was already too late for either of these treatments, the attending physicians explained. But an emergency room physician told her husband about the ongoing Stanford trial and, with her husband’s permission, called Stanford. Within 30-45 minutes, a helicopter operated by Stanford Health Care was on the scene to whisk Dodd to Stanford Hospital. By the time Dodd’s husband and high-school-age son, driving up from Salinas, had arrived at Stanford, she was already out of surgery. Seven days later she was discharged. Almost fully recovered today after a combination of her thrombectomy, intensive rehabilitation and personal gumption — Dodd sports a tattoo reading, “I can, and I will” — she said, “I am literally standing on this Earth as a wife and a mother because of that procedure. It saved my life.” She is talking, walking and driving as before, and will return to her full-time job in March. “These astounding results will have an immediate impact in the clinic and will help us save many lives,” Walter Koroshetz, MD, director of the National Institute of Neurological Disorders and Stroke, said in an NIH news release. Results of the trial will be published online Jan. 24 in The New England Journal of Medicine to coincide with Albers’ presentation of the results at the American Heart Association‘s International Stroke Conference in Los Angeles. The AHA is expected to issue new acute-stroke treatment guidelines that reflect what the study found. Key to the study’s findings is a growing understanding that different individuals’ strokes spread through brain tissue at different rates, Albers said. It’s not so much the amount of time elapsed since a stroke began as the amount of remaining at-risk but salvageable brain tissue that determines who will benefit from stroke therapy, he said. The investigators used the brain-imaging software to rapidly evaluate blood-flow data generated from incoming patients. Albers developed the software about a decade ago with study co-author Roland Bammer, PhD, then an associate professor of radiology at Stanford and now at the University of Melbourne in Australia, and software engineer Matus Straka, PhD, who was then a senior scientist at Stanford. Thrombectomy involves guiding a cagelike stent through the circulatory system to the site of an acute-stroke patient’s brain clot, where the stent then encases the clot and physically extracts it. The procedure is currently recommended only for patients who reach a treatment center within six hours of a stroke. As many as 35 to 40 percent of all strokes occur during sleep, so the short window of time severely limits the number of stroke patients getting this procedure. Another treatment, intravenous injection of a clot-dissolving substance, has an even tighter AHA-recommended time limit for efficacy — 4.5 hours — and isn’t very effective for treating large clots. In the trial, patients were evaluated at treatment centers between six and 16 hours after incurring strokes originating in either of two large arteries in the brain: the middle cerebral artery or the internal carotid artery, which together account for about 25 percent of all strokes and the majority of severely disabling strokes. Patients age 90 or younger whose brains showed evidence of substantial amounts of at-risk but salvageable tissue were randomized into two groups: One set of patients, the intervention group, received thrombectomies. The others, the control group, received standard medical therapy. Among the patients entered into the study, those who received a thrombectomy had far superior outcomes compared with those who didn’t. Patients were followed for 90 days after their strokes. (After this time period, stroke patients typically experience little additional recovery.) By 90 days, 26 percent of the patients in the control group had died and 16 percent had devastating disability. In contrast, only 14 percent of the thrombectomized patients had died, and 8 percent had severe disability. The combined plunge in these feared outcomes, from 42 percent of patients to 22 percent, represents the biggest improvement seen in any stroke-treatment trial to date, said Albers. There was a slight, statistically insignificant increase in bleeding from the spot in the brain where the clot had been extracted. But this effect was dwarfed by the overall reduction in death and disability among those treated. As a result of the trial’s findings, which confirm and expand on a recently published large clinical trial using the same software to inform treatment decision-making, thrombectomy procedures for late-arriving patients will probably double, said Albers, and this also opens up the prospect of using clot-busting medications well beyond the current 4.5-hour window. The team’s work is an example of Stanford Medicine‘s focus on precision health, the goal of which is to anticipate and prevent disease in the healthy and precisely diagnose and treat disease in the ill.
To read the article click on the given link.